Houston Marathon weekend is one of my favorite times of year! There are big flag like signs all over the city that look like mile markers, which makes me think of getting in miles, which makes me think of races, which makes me think of new race shirts, which makes me happy! One of my biggest dilemmas is that the HouMar (which is the adorable nickname I just gave this race) is usually on the same weekend as Disney's Marathon Weekend, which, of course, trumps everything in life. After doing the Goofy Challenge last year, my mom really helped put things in perspective for me by saying maybe I should run Disney every OTHER year. (Read: A guaranteed Disney Runcation with my sweet momma's blessing every other year!? Please! Yes, even though I'm pushing 30, I still get this whole "you're blowing your allowance on THAT?!" vibe when I tell my parents/Donnie/non-runner friends that I'm signing up for another race.) (But guyyyyys! There's a t-shirt and stale bagels/cold pizza/sad oranges/room temperature beer at the end!) This year the HouMar fell on the weekend after Disney. I thought I was going to be overwhelmed with jealousy when I saw my friend's pics from WDW the weekend before, but surprisingly I was so focused on Houston to get too upset for too long. Here's some pics to walk you guys through my weekend. We kicked off the weekend with a pasta carb load party. What did we eat, you may be asking? Just the most clutch pre-race fuel you could get- pizza and cookies. But don't worry, we decided soda would be a bad idea. Don't want to get dehydrated. Saturday morning was a little 5k shake out run. (You got another medal at the end of the marathon if you did the 5k the day before. Go big or go home, kids.) The timing of this race was perfect. The gun went off at 8….and the expo, located at the finish line, opened at 8:30. Fabulous! Again with that crazy, ridiculously awesome (and good looking!) group! Have I mentioned lately how wonderful they all are? Side note- Timmy actually is more badass than all of us. He opted out of the full marathon because he ran the Dopey Challenge (ahem, 48.6 miles….) just last weekend. Yeah. He's cray. Got my Nuun hydration on…and snagged a free water bottle! That's what it's all about, folks. I could probably be a spokesperson for Gu Roctane. Stuff keeps me going! And, all of the flavors look so cute and colorful on my fuel belt. Taste the rainbow. Go time! I figured I should probably give myself a little reminder as to what day it was. Sometimes I'm pretty delirious when I wake up. It's hard to come to after a long night of sweet puppy snuggles. We look good. I'd give us a shout. So our corral leaves, and we're off! Despite my training going pretty well, it was a really tough race for me for some reason. The weather was perfect, the course was flat, and the spectators and volunteers were incredible! All things were a go for launch! But around 7 miles in, my quads were killing me, and my knee was making me wonder. And quite frankly- I was about 15 miles tired at mile 9. At mile 10 I knew my sub-4 wasn't in the cards for me today, so I switched my focus to finishing with a PR. By mile 13, I was wishing I had taken that turn at mile 8 that marked the split from the half and full courses. 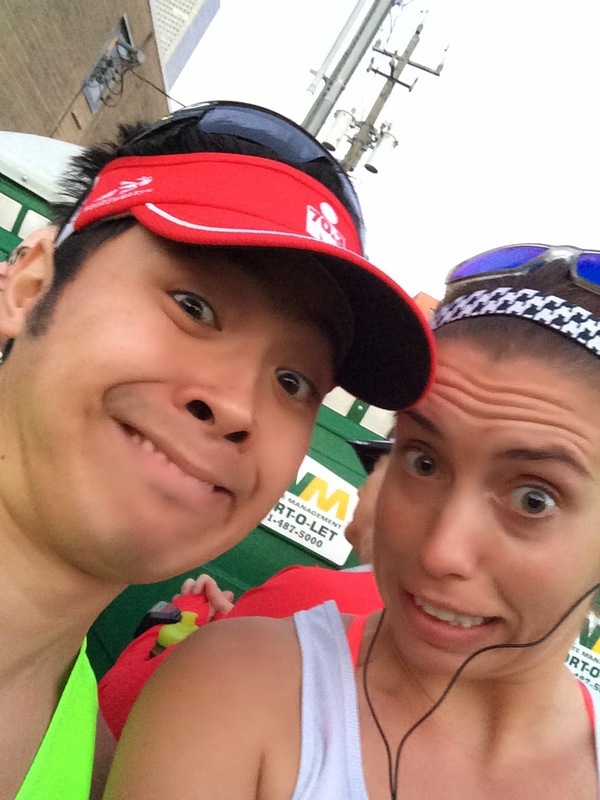 I (literally) ran into my old Team in Training coach Audree around mile 15. Girlfriend kept me going for about a mile or so, thank goodness! I knew Timmy had finished, and he had said he'd try and make it to mile 20. I had a few more sweet friends that told me they'd be at mile 24 (bless their hearts). So I started counting down. 5 miles to Timmy, 9 miles to the girls. 4 more miles to Timmy, 8 to the girls. 2 miles to Timmy, and no more than an hour til I see the girls! It was pretty pathetic. Until I got the most energetic pump up from Timmy just before mile 21. Even with 13.1 miles under his belt, he still leapt (yes, leapt) onto the course with me, hooting and hollering, and making sure I knew I had this. Thank God I saw him before I saw the beer tent, or else I probably would have called it quits and just drank myself into oblivion. About a half hour later, something wonderful happened…. After the party it's the after party! After everyone totally killing their race that morning, we had the gang over for a fiesta that night. Bags of ice, chips, champagne, good friends, and Cards Against Humanity. I couldn't think of a better way to end my favorite weekend! I need to give Donnie a big ol' shout for being so amazing and supportive, and putting up with all of my ridiculous hours of training for the last few months. Poor guy wound up waking up with me at 4 am every morning, too, because I'm about as graceful as an elephant when I'm trying to get ready for a run/gym trip/bike ride in a half asleep stupor. He's the greatest, and SUCH a champ! I'd say "until next year, HouMar," but next year happens to be a Disney year. I don't hate it! PLEASE come to Disney!! We'd have the funnest time!!! Thanks so so SO much for being out there last week! I just loved seeing your face! Congrats on the PR... A whopping 40 minutes is pretty ridiculous! Thanks, Christina! They changed up the course this year- you should run it when you get back from across the pond! Congrats on the marathon!!! A PR of 40 is amazing!! :) I'm going to strategically place my friends/family around the course because I know I'm going to need them!! Thanks, Becky! It was SUCH a help having familiar faces along the route! Such a game changer! When's your race?